Marisa Olson: There is a consistent question, in your projects, about the relationship and overlaps between real and virtual spaces. How did you become interested in this and how would you compare working in Second Life to working in Montello, as you did previously? eteam: In 2002 we found out that it is possible to win land on eBay. Potentially for even as little as $1, which seemed affordable to us. Ebay sellers usually recommend doing a site visit before bidding. We didn't do that, because for us the "photo taken in the area‚" (seller's quote) which did not depict the real estate, but a generic version of it, was the perfect starting point to work with a place. And, by becoming landowners we didn't need anyone's permission or approval to do what we felt had to be done and what we considered a potential possibility of the land. The only parameter we set was, that the land should not be used for any physical structure. We wanted to keep it open and empty for mirages and other concepts to hover freely above the property or emerge unobstructed out of the ground. What's interesting for us working with land in SL and with a desert lot are how ideas of emptiness and flatness compare. When we looked at the photo of our desert property for the first time, we were convinced that it was in the middle of nowhere and that there was nothing there. But then, the longer we worked with the land, the more it presented itself. With every site visit there were more animals, historic artifacts, weather situations, people, stories, F16s, adventures, surveying problems, UFOs, dead cows etc. Is this a little like Second Life? When we heard about Second Life for the first time, we imagined it to be a kind of utopia, where people would create things that are impossible to even think of in the Real World. But, even after SL replaced our first life for a while, we could not permeate the top layer. There is no shovel around to dig that ground, no way to go beyond the surface. Maybe that's why we are currently investigating the possibilities of our SL land as a public dumpster -- to fill the place with some kind of history by leaving traces, to introduce the decay script. On that note, where do you think your work resides? There is often an element of field work or research, which can involve performance, followed by videos, and installations. Does your take on virtuality apply to your take on documentation? We are constantly trying to figure out this problem: If virtuality is the inherent ability or potential of something to come into existence, how do we picture this potential, how do we document it, what do we call it and how do we protect it from turning into a reality that will be fenced-in by its practicalities? Until we worked in Second Life, we called physical access to a site "facing reality". When we went out West and visited our property, we had to wear boots, hats, sun lotion and drink water. Despite the fact that we tried to stay as abstract as possible, we still had to deal with facts, listen to people, and stay around long enough to find out if a certain reality was present at the site, one that was waiting to be identified so it could temporarily emerge with a name, like "International Airport Montello," for example. Now we are asking ourselves: Was this a reality, because it was based on two abandoned landing strips behind the town of Montello and therefore connected to the land? Did this reality temporarily manifest itself, because it had been innate to the air around this place anyway, or were we lucky, because we proposed our concept to a group of people who believed that "Whatever the mind can conceive and believe it can achieve!," as Dr. Ron, our airport manager, said. [12:50] eteam: and on what level it operates. I get stuck a lot and in the end it's just a relief that I can clean up this dump in order to make space for new stuff. How do you spend most of your time? [12:52] Rolando Ember: either at my military base or exploring. I don't take this seriously at all. How about you? [12:54] Rolando Ember: is this all you do on here? [12:55] Rolando Ember: what's the fascination with trash? [12:56] Rolando Ember: why can you not get over it? It's really not that deep. Your work often humorously touches upon the serious issues of consumption and the environment. Do you situate this work in relation to activism or pranksterism at all? A friend of ours once interviewed the owner of a funeral home about his work and asked how he dealt with so many dead people all the time. According to our friend, the funeral home owner was very sincere when he said: "If it gets too much, I just focus on the first part of my business. Look what it says: Fun." After a presentation we did last year about International Airport Montello, a friend of ours came up with a similar conclusion. He said: "Now I understand the conceptual part in your work. You are con-artists." Whereas we think we are con-sumers, no matter what matter the product is made of. When I saw you at the great Light Industry screening you recently organized, entitled "Outside With the Others," you handed me your business card pencil (your business pencil?) that says "Obscurum per obscurius, ignotum per ignotius." Is this your artist statement? What does it mean in your work? While we were trying to figure out if seeing is seeing, or seeing is believing, and if jumping from one to the other required something like a paradigm shift, we stumbled upon "obscurum per obscurius". In its direct translation this stands for "the obscure by means of the more obscure", while "ignotum per ignotius‚" describes "the unknown by means of the more unknown". Most interpretations suggest that the phrases are identical and stand for "an explanation that is less clear than what it tries to explain", which is considered to be a flaw and a problem. We wondered if that's the right conclusion, and since we - as a team of two - like to question everything twice - we thought we should distribute the uncertainties and see how others respond to that. The golden imprint on 1000 unsharpened royal blue pencils turned out to be the perfect way to do that. The imprint is very unreliable. If you hold the pencil in a sweaty hand for a little while, or let it flying around in your bag for a couple of days, the statement will rub off and next time you look, all you see is Royal Blue. If one looks at your body of work, it would appear that you are serial collaborators--not just with each other, but with other artists, with the general public, and with institutions. Why is this collaboration important or interesting to you and do you think that working online is any more or less conducive to such practices? We just had a discussion with someone who was very much against our use of the term collaboration. We on the other hand, are very skeptical to use the term "participant‚" and much more prefer collaborators. We are curious about the collective identity that builds around an idea we propose for a certain place. 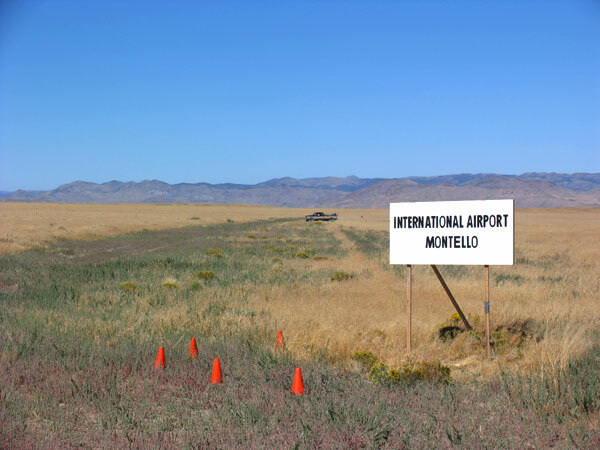 The ways in which the airport in Montello manifested itself, for example, were completely dependent on the visions and skills of the individuals who chose to represent this idea. Tools, like a wiki-site, satellite Internet access and the installation of a public computer in Montello helped to establish a shared platform/stage. This way every collaborator was able to play with the concept of the airport in his or her own way and therewith shaped the direction things were going. All we offered was to witness and document the construction of this world. What is the next frontier for eteam? An allotment garden community in Germany, that will join forces with people from Montello, NV in an exemplary search for water. It's kind of a practical approach to "open source."